Windows 10 is a revolutionary operating system. It comes with many graphical changes, especially the Start Menu. But, where is Accessories in Windows 10? Accessories folder contains some useful system tools like sticky notes, Math Input Panel, Snipping tool, etc. A user, who has come from old Windows systems might face problems to locate this folder and its tools. Do you think that it is missing from the Windows 10 Start Menu? Actually No! It is available in the start menu and you need to find accessories in Windows 10 to access your favorite system tools. 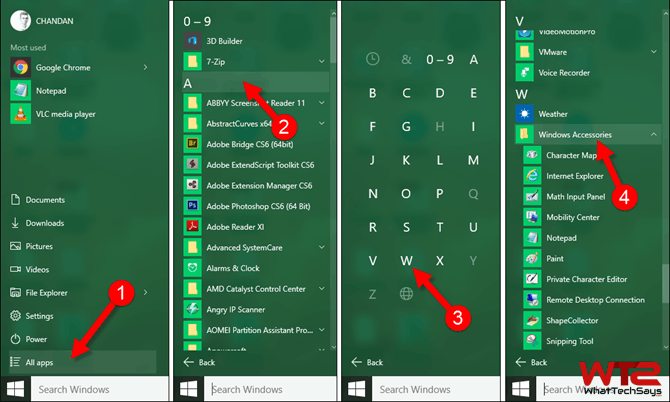 This article would be helpful for you if your Windows 10 start menu search is not working. If you have recently upgraded your system to Win 10 and facing problems to use the start menu, then install Windows 7 start menu in Windows 10. The all application section has been totally changed. All applications are now arranged alphabetically which is a little bit difficult to locate your desired application quickly. Well, the way we provide you in this post is totally simple. Just follow these two procedures to find Accessories in Windows 10. Follow these basic steps to know where is Accessories in Windows 10. 1) First of all, open any folder or click on the File Explorer icon on your computer’s taskbar. 2) File Explore will open on your computer screen. After that, copy the below path, paste it to File Explorer’s address bar and hit Enter. 3) Soon, you will see the Accessories folder on your screen showing the available Windows 10 system tools. This is the quickest way to locate all system tools in the accessories folder. Where is Accessories in Windows 10 Start Menu? Accessories folder contains tools like Character Map, Sniping Tool, Math Input Panel, Remote Desktop Connection, Notepad, Paint, Sound Recorder, Steps Recorder, Windows Fax and Scan, Sticky Notes, Windows Journal, WordPad, XPS View and more. Let’s locate it on the start menu. 1) To find or access the Accessories folder in Windows 10, click on the Start Menu and then click on the All apps. You will see a list of all the apps organized 0-9 and A-Z. 2) You could scroll down the list till your reach W or click on any letter from the all apps section. 3) It’ll show you all alphabets. Furthermore, click on the “W” button to go to the all apps section start with W letter. 4) Here you’ll get a folder named “Windows Accessories“. Click on it and you can see all items shown, therefore. 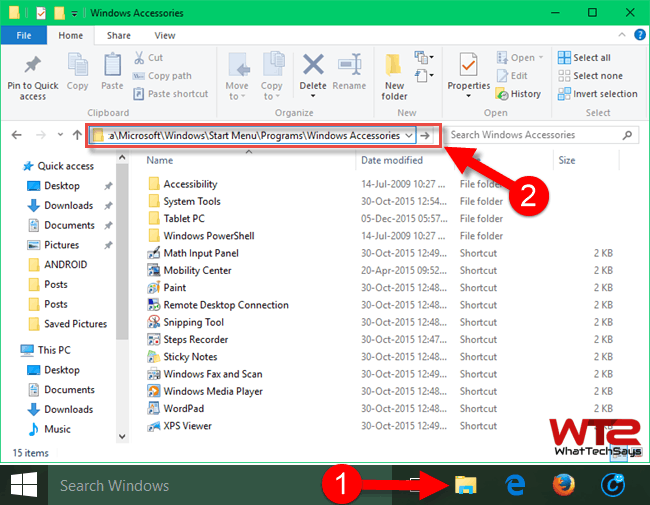 This is the easy way to get where is Accessories in Windows 10. The old “Accessories” has been changed to “Windows Accessories” in the new operating system. The first procedure is much easier to find accessories in Windows 10. You can also make a shortcut with address if you are using these system tools frequently.